We’ve all been there. Whether it’s down to jet lag or a crying baby, shift work or a late night, when we miss out on quality sleep the next day isn’t pleasant for anyone. We’re usually cranky and short-tempered and we find it difficult to function, stay motivated or focus on work. As most of us know, our circadian rhythm is the natural 24-hour cycle that regulates our sleep/wake pattern. This cycle also regulates our bodily functions — growth, appetite, blood pressure, our hormones, body temperature and when we feel alert or sleepy. While we sleep, our body is still busy — especially the pituitary gland as it controls the functions of other glands. This ‘master’ gland secretes a growth hormone and a thyroid-stimulating hormone into our bloodstream as we slumber, both of which help to maintain a healthy metabolism. If we miss out on sleep, levels of these hormones drop. This has a knock-on effect on the production of other hormones and our hormone balance. Our ‘sleepy’ hormone melatonin is also secreted when light fades in the evening and this hormone is critical to our quality of sleep. Are you one of those rare people who doesn’t need much sleep? If so, you have what is referred to as a genetic ‘short sleep’ gene, requiring only five to six hours of sleep per night. If you have a ‘long sleep’ gene you need up to 10 hours of shut-eye every night. Most of us (97 per cent) need seven to nine hours of sleep every 24 hours. Lack of sleep can be fatal. According to the Ministry of Transport, in 2013 fatigue was identified as a contributing factor in 3.2 fatal crashes in New Zealand, resulting in 33 deaths. For every 100 drivers or riders who died in road crashes in which fatigues was a contributing factor, 33 passengers and 36 other road users died with them. The blue light emitted by TVs, computer screens and phones suppresses our body’s production of melatonin, which helps us to fall asleep at night. If our body isn’t producing enough of this hormone, it can make getting to sleep even more challenging. Our advice? Take a break from laptops, tablets and smart phones in the evening, especially just before bedtime. Up to 20 per cent of New Zealanders have problems either getting to sleep or staying asleep. A lack of sleep doesn’t just make us cranky. Dr Alex Bartle of the Sleep Well Clinic in New Zealand explains that when we’re tired or fatigued, it causes a change to the two primary hormones that regulate our appetite: ghrelin and leptin. When we miss out on sleep, leptin levels fall and ghrelin levels rise which in turn can cause an increase in appetite. Is your sleep pattern making you fat? There are some well-established links between lack of sleep and weight gain. Studies show that we eat 1500-2100 more kilojoules a day after a poor night’s sleep. An American health study — the Nurses’ Health Studies — that monitored the weight, diet, lifestyle and sleep habits of around 65,000 nurses showed a clear link between sleep duration and weight gain. Women who slept less than five hours per night gained more weight than nurses who slept seven to eight hours per night after 16 years. Results showed that those women who slept five hours or less per night had a 15 per cent higher risk of becoming obese, compared to women who slept seven hours per night. Another study of 83,377 US men and women aged 51-72 years reported a 40 per cent higher risk of developing obesity in those who slept less than five hours each night, compared to those who reported seven to eight hours of sleep. The Wisconsin Sleep Cohort study also found that less sleep was clearly linked to weight gain and this affected both men and women. Further research in other countries is consistent with these results. There are a few reasons why sleep deprivation could increase the risk of becoming obese. If we are sleep-deprived, we may be too tired to exercise and so miss out on the health benefits and kilojoule burn that would balance out any weight gain. Also, if we sleep less, we’re awake for longer and we have more opportunities to eat. Any lack of sleep upsets the balance of the key hormones that control our appetite, so we feel hungrier when we’re tired and are more likely to make poor food choices. A new study by the Albert Einstein College of Medicine in New York says lack of sleep has become a well-recognised risk for childhood obesity. The research, carried out in the UK, found that children with the shortest sleep time (less than 10.5 hours) at ages five to six had a much greater risk of being obese by age 15. Sleep disorders: Could you have one and not know it? Research shows that sleep-related disorders reduce the quality of life of an estimated 240,000 New Zealanders but in spite of the toll sleep deprivation takes on us only a small percentage are investigated. Those suffering from ‘sleep debt’ often reach for sleeping ‘aids’ such as herbal preparations and sleep supplements, or a doctor may prescribe sleeping pills or even anti-depressants if symptoms are related to other medical conditions. Sleep loss can lead to weight gain, but the opposite is also true as rising rates of obesity are increasing the prevalence of sleep apnoea. Obesity increases the risk of obstructive sleep apnoea (OSA) due to excess fat tissue around the neck which exerts pressure on the upper airways. There’s nothing worse than lying awake at night. Insomnia is the most common sleep disorder. ‘Transient’ insomnia only persists for a week or two but if sleeplessness continues for weeks or regularly for more than six months, it is referred to as ‘chronic’. Primary insomnia is a problem with the sleep process itself, whereas secondary insomnia is caused by another problem such as depression, anxiety, sleep apnoea, alcohol/substance abuse or another undiagnosed sleep disorder. As a result of lying awake at night, insomnia tends to be recognised easily, but with obstructive sleep apnoea syndrome (OSA) you continue to sleep even as you are struggling to breathe. Apnea literally means ‘no breath’ or ‘stopped breathing’. These pauses in breath can last for 10-30 seconds or for up to one minute or more and the result is broken, poor quality sleep. In a bad case of sleep apnoea the sufferer may stop breathing up to 700 times a night. This leads to daytime sleepiness, which is a characteristic feature of OSA. Often the symptoms of OSA are ignored or simply put down to age, stress and work pressures. Obstructive sleep apnoea is usually associated with loud snoring (although not everyone who snores has this disorder). Studies show that men have a higher incidence of OSA than women (four per cent vs two per cent). However, the Wisconsin Sleep Cohort study estimated that OSA was undiagnosed in more than 90 per cent of women with moderate to severe OSA. Another Canadian study noted that women with OSA more commonly had a diagnosis of depression (21 per cent for women vs seven per cent for men) and were also found more often to be taking psychiatric medications (25 per cent for women vs eight per cent for men). Why is this? 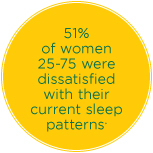 Women often present with symptoms that aren’t classic symptoms of OSA, such as headaches, lack of energy, fatigue and insomnia. Women may also be embarrassed by snoring (a classic OSA symptom) as it’s seen as ‘unladylike’ and are therefore less likely to report it. Some physicians may also have a pre-defined notion of a typical sleep apnoea patient as a middle-aged overweight or obese male and don’t look for sleep apnoea in these women. So, the cycle of sleeplessness continues, leading to the consequences of poor sleep such as irritability, exhaustion and mood disturbances as well as misdiagnosis of other related medical or psychiatric conditions such as depression. One of Britain’s leading authorities on sleep explains that women need 20 minutes more shut-eye because of the active female brain. “One of the major functions of sleep is to allow the brain to recover and repair itself,” says Professor James Horne, director of the Sleep Research Centre at Loughborough University, England. “During deep sleep, the cortex — the part of the brain responsible for thought, memory, language and so on — disengages from the senses and goes into recovery mode. Female hormones get blamed for many things and now we can throw lack of quality sleep into the mix. 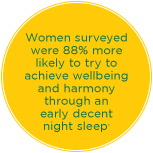 Newer research reports that women have different sleep requirements to men, which haven’t yet been widely recognised. Studies show that some women have decreased melatonin levels in the second phase of their menstrual cycle (post-ovulation when both progesterone and oestrogen levels drop sharply). As melatonin is critical to ensure a good night’s sleep, this decrease in our ‘sleepy’ hormone can make it difficult to fall asleep and to stay asleep. For a lot of mothers, fatigue is one of the first signs of pregnancy. Post-partum, fatigue is a natural result of the sleeplessness caused by your newborn waking up throughout the night. Up to 60 per cent of all new mothers experience post-natal blues within the first two weeks but up to 15 per cent of women will go on to develop post-natal depression. Mothers with the worst depressive symptoms at four and eight weeks after delivery are more likely to report having less than six hours sleep in a 24-hour period. Insomnia and fatigue are common health complaints of peri-menopausal and post-menopausal women — it’s estimated that about 50 per cent of women aged 40-60 experience trouble sleeping and this is linked to sleep apnoea as well as hot flushes (due to changing levels of oestrogen). Try to stick to a regular pattern of bedtime and awake time. Try not to nap during the day — your ‘nana nap’ may steal sleep from you that night. Avoid caffeinated and sugary drinks in the evening. Exercise can encourage a good night’s sleep. Just remember to exercise well before bedtime (ie. not within three hours of sleep). Try to eat your last meal two to three hours before bedtime — avoid big dinners just before bedtime. Exposure to natural light is important for the production of melatonin so it’s important to get outside every day (if possible without your sunglasses on if the sun isn’t too glaring). Don’t use the bedroom for anything other than sleep and sexual activity (ie. don’t watch TV, do crosswords, study). Keep the bedroom cool, dark and quiet.